Perfectly seasoned sirloin steak recipe with tender asparagus and cherry tomatoes. 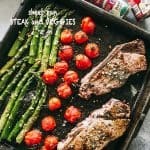 An easy steak sheet pan dinner idea that’s SO easy and SO darn delicious! 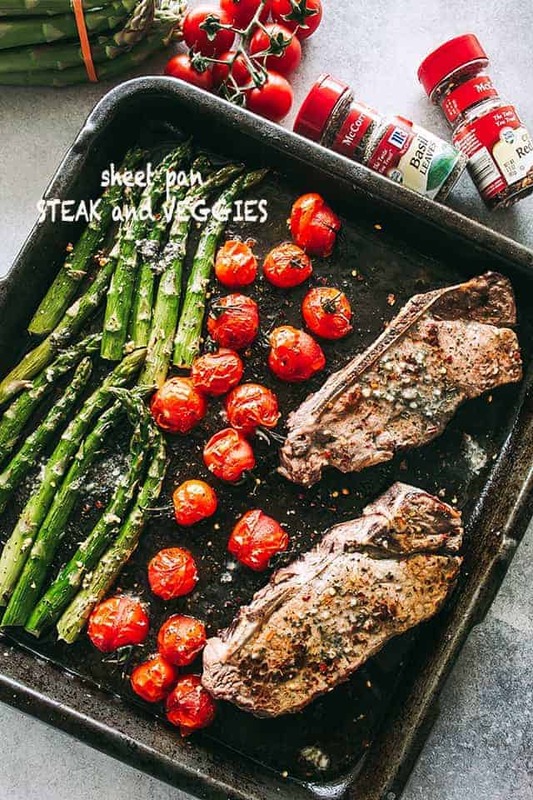 Steak and Veggies Sheet Pan Dinner is a quick and easy way to have a flavorful, homemade meal on the table during busy week nights. We are simply going to just assemble all the ingredients on a single sheet pan and pop them into the oven for a fantastic dinner. Thank you, McCormick®, for sponsoring this post! All opinions are always 100% my own. Clearly, I still stand firm on my conviction that all-in-one-pan-30-minute-meals are the only food to have! This 30 minute steak and veggies dinner is well-balanced and anyone that gets a taste of it, will ask for you to make it again and again. Just look at that steak… it’s flawless! Notice the melty herbed butter on top? Everyone needs a dose of that Basil Garlic Butter in their lives. I made it with McCormick’s® Basil Leaves, some salt, and garlic. Plus butter. It was fabulous. 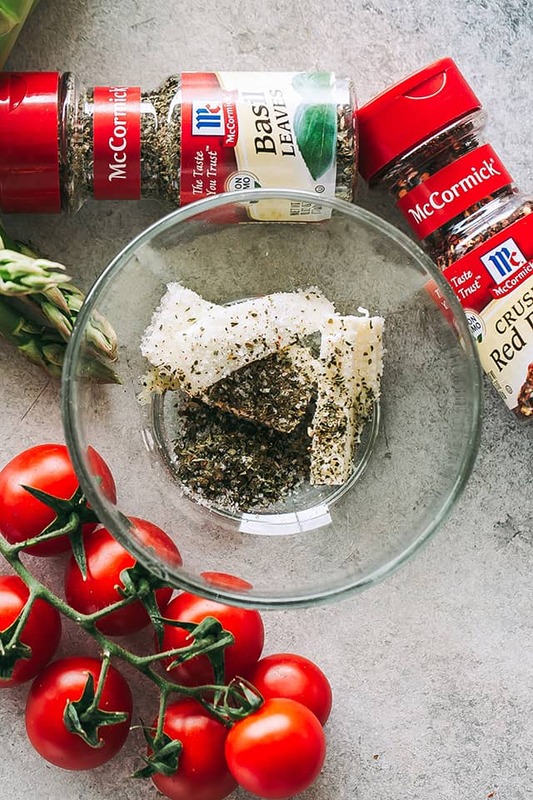 We are also going to use McCormick’s® Crushed Red Pepper to bring life to our steak. A key element of any great recipe is herbs and spices. Both are included in recipes to enhance flavor, texture and sometimes color. 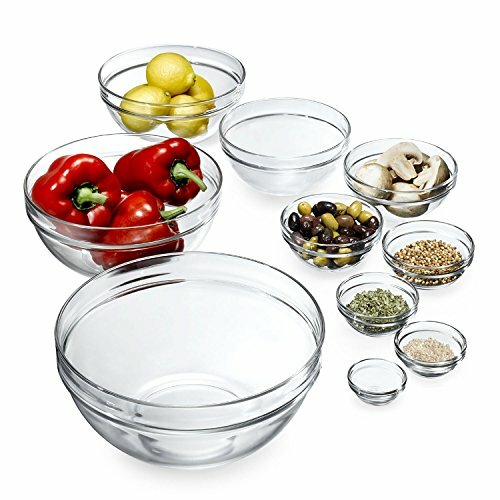 Easy to use herbs add a unique zing to any meal and can take a dish from good to superb! It’s safe to say that with the help of McCormick® herbs and spices, flavor loaded, light dinners are making it easier for people to stay on track with their home cooked meals resolution. The steps are quite easy and simple. 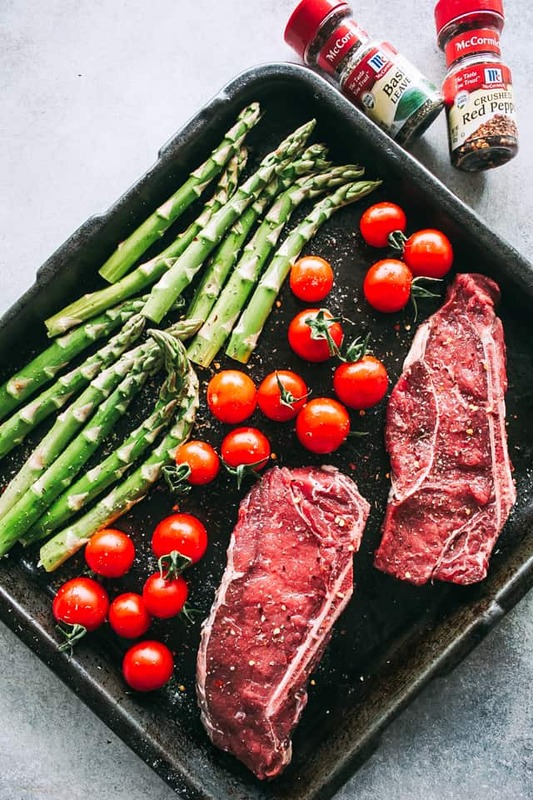 We are going to add our asparagus and cherry tomatoes to a sheet pan and season the veggies with olive oil, salt, pepper, and McCormick’s® Basil Leaves. The veggies are then par-roasted for several minutes to get a head start. In the meantime, we are going to prepare our steaks. I advise to get top sirloin steaks that are about an inch thick. Steaks will also be seasoned with salt, black pepper, and McCormick’s® Crushed Red Pepper, adding a slightly spicy joy to the overall taste. Then, the steaks are added to the sheet pan and cooked for about 8 minutes, or to your desired doneness. 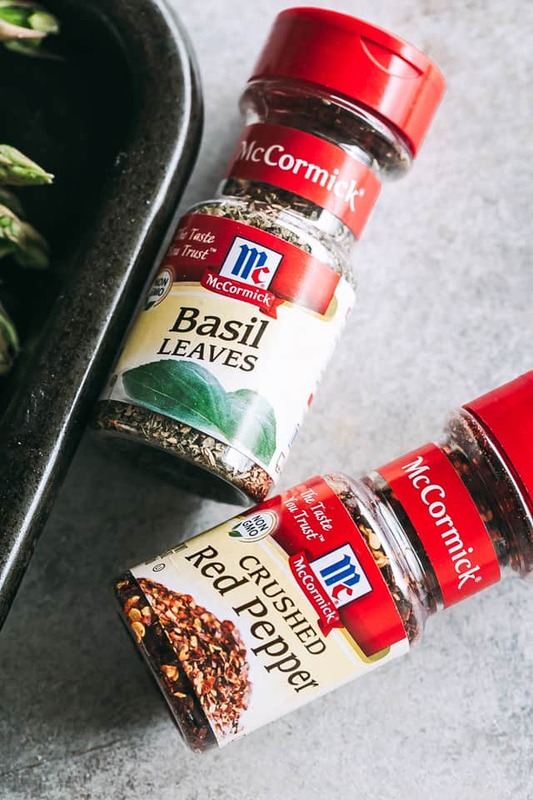 While our meal is in the oven, we will make our Basil Garlic Butter by combining couple tablespoons of butter with McCormick’s® Basil Leaves, some garlic, salt, and pepper. All of that is mixed together with a fork until thoroughly combined. Spoon a few dabs of butter over the done steaks and veggies and serve. If you do not want to use butter, you can also stir McCormick’s® Basil Leaves, some garlic, salt, and pepper into 2 tablespoons of extra virgin olive oil. The roasted veggies, which are also our side dish, are amazing and complement the juicy steak beautifully. Another tip about this steak and veggies dinner: Take a few minutes in the morning to prep this recipe, and you can come home from work and get dinner on the table in about 20 minutes. For more information about McCormick®, please visit their WEBSITE. You can also follow McCormick® on Instagram, Facebook, Twitter, and Pinterest. 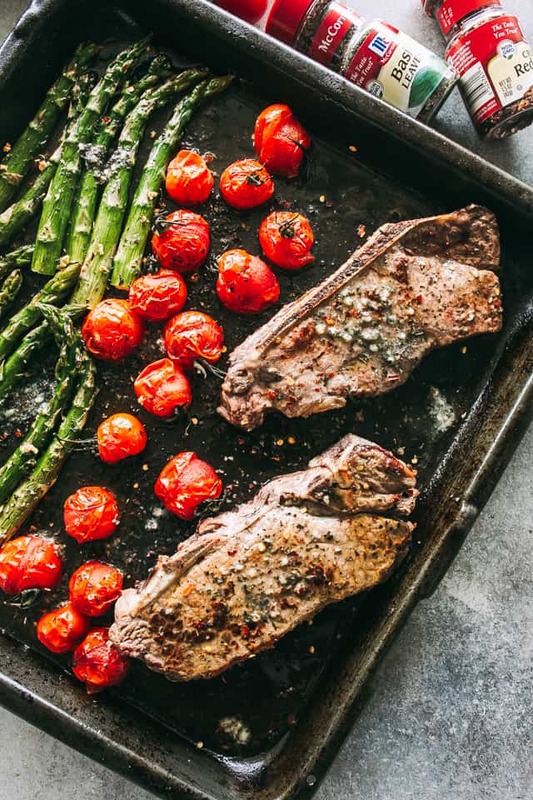 Perfectly seasoned sirloin steak, tender asparagus, and cherry tomatoes prepared together on just one sheet pan. SO easy and SO darn delicious! Drizzle veggies with extra virgin olive oil and season with McCormick® Basil Leaves, salt, and pepper; using your hands or tongs, mix the veggies around until they are evenly covered with oil and seasonings. Roast vegetables for 10 minutes. In the meantime, prepare the steak by seasoning with salt, pepper, and McCormick® Crushed Red Pepper; using your hands, rub the seasoning into the steaks. 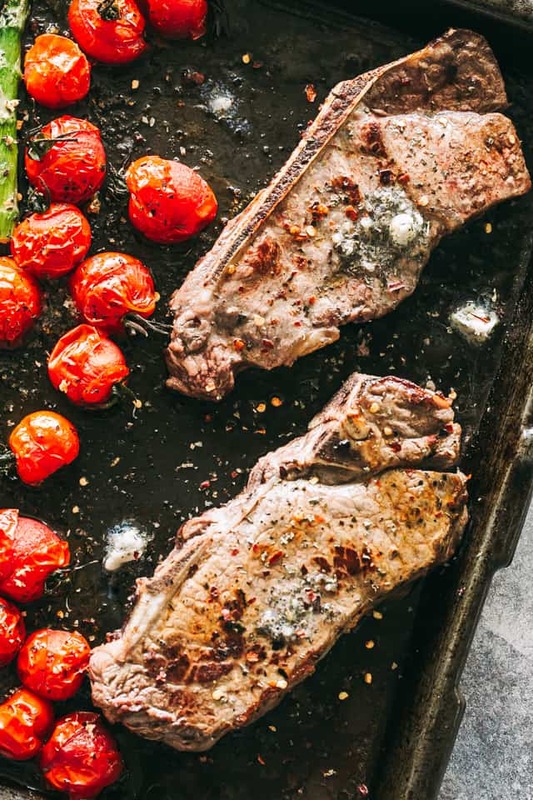 Remove sheet pan from oven; push vegetables to the side to make room for the steaks; place steaks on the sheet pan and roast for 10 more minutes, or until desired doneness is reached. Flip the steaks half way through cooking. In the meantime, prepare the Basil Garlic Butter by combining the butter, McCormick® Basil Leaves, garlic, salt and pepper in a small mixing bowl. Using a fork, mix and mash the butter mixture until well incorporated. Remove sheet pan from oven and spoon a few dabs of butter over the done steaks and veggies. Garnish steaks and veggies with basil leaves and crushed red pepper. If you do not want to use butter, you can also stir McCormick's® Basil Leaves, garlic, salt, and pepper into 2 tablespoons of extra virgin olive oil. This looks delicious! Sheet pan dinners are always on my list! This is a perfect weeknights meal. You’re right, the spices bring it all to life. Such a great staple dinner option! Love how you made such a flavorful compound butter with the spices! 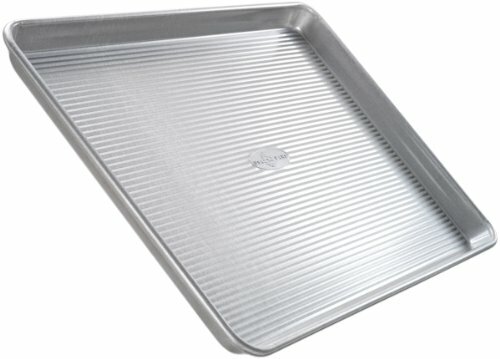 I’m always looking for new sheet pan meals! This one looks amazing! I LOVE a good sheet pan dinner and these flavors sound AMAZING! I make this dinner all the time and it is SO good!! Sheet pan meals are my fave! This looks wonderful — and oh, so easy! I can’t wait to try this recipe! I am going to prep that morning, so it will be quick and easy! I love how easy this is to get on the table! I know my husband is going to approve! I’m with you on the whole 30 minute dinner idea! This looks like another fabulous one to add to the line up! My whole family could get behind this meal. Easy, hearty, fresh, delish!